It's so funny that I have punched/kicked into the thin air all my life. I can't remember when that I started to hate it. In the past many years, I like to punch/kick on my heavy bag. The counter force that come back from my heavy bag make me feel good. When I punch/kick into the thin air, I feel "empty". Am I the only person who feels this way? Last edited by johnwang on Wed Nov 21, 2018 3:04 pm, edited 1 time in total. The last heavy bag punching for me was your bag John. Thanks for teaching me about the fundamental way to do XingYi punch. I can make the bag bounce with it. becomes tare weight. No bounce. You might be JW. I found that since I don't have a heavy bag at home that I thought I would do "shadow fighting" (it's not just boxing). I find that without the bag I can break it up to focus on leg work, evasion, angles, balance, setups, rhythm etc. After doing this for a bit, then entering a tournament with a couple of matches, coming out feeling great I thought I would double down on "punching/kicking the air" ... and trying to pay attention to everything else. I even built a bit of a personal curriculum. Don't get me wrong - I like the heavy bag to. Plus sparring. No to chains of forms. Yes to drills with an awareness while doing them. I can't say I hate empty air practice, but the verification coming back when I punch or kick the heavy bag reassures me I am doing it right. to me it's the difference of learning the mechanics of a motion (empty air technique) and learning the connections of a movement. 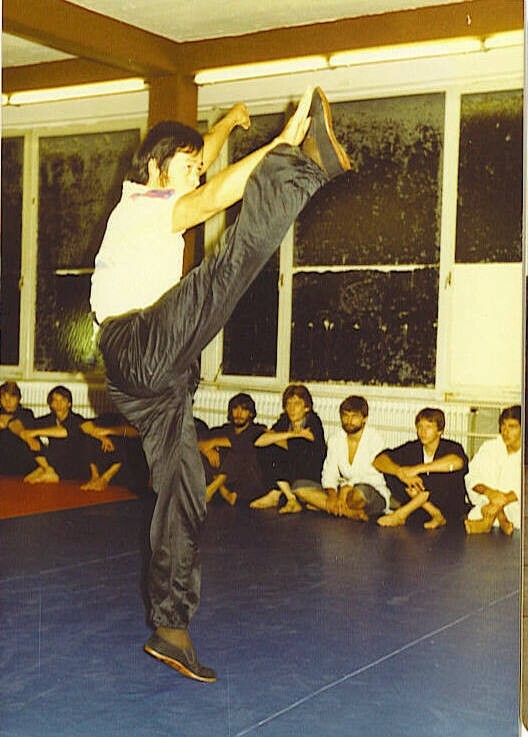 An example of this would be practising a throw on a non-existent training partner, then practising a throw on a partner. The connection is completely different. What's the value to learn "empty air technique" and "throw on a non-existent training partner"? How do you know that your body is strong enough to take the counter force that come back from your opponent? - roundhouse kick on heavy bag, my body won't feel comfortable with the counter force. - throwing dummy, my body won't feel comfortable with the throwing dummy weigh. It takes much more to deal with the object than to deal with the thin air. It's interesting; if you are focused on "the external" than feeling empty makes sense. Fighters tend to do shadow work, pad work and heavy bag work for good reason. The modalities allow you to focus in different things, as well as having some crossover. It helps if you understand what attributes are best served by each modality. That way there is room for them.. Heavy bags are for power work predominantly. Whilst they can be used for other work, pros use them for their main purpose because they know and understand what they get from other work: padwork and shadow work. These 3 represent the main staples for striking. If you aren't clear on those then doing all your work on a heavy bag will make sense to you in a different light. It can work for you at your level and be of benefit, but that doesn't mean either that's it's the best way. You have a tendency to project subjectively about your own journey and where you are. This may be best for you based on where you are - but objectively for people coming into martial arts and fighting a more objective approach needs to be taken. You are probably such an old timer and expert in what is to be gained by 'just movement' practice, that the diminishing return for you doesn't feel worth it. And that's all fine! I can understand if your lifelong practice has been one sided for so many years, you probably have things to make up for, I imagine it's more a mental thing in your case. Other people can and do balance their training differently. There's probably hardly a single striker (that fights) in the whole world who doesn't or can't find any value in shadow boxing. I think we can guess that that can and will mean kicks and knees and whatever else is required. Last edited by cloudz on Thu Nov 22, 2018 5:22 am, edited 5 times in total. meeks wrote: to me it's the difference of learning the mechanics of a motion (empty air technique) and learning the connections of a movement. Yeah, there’s no point of practicing throwing in air if you have a partner. There’s no point of hitting the air if you have something to punch at. I punch at things. But I don’t do it to practice power through strength, I do it to practice power through relaxation. You test relaxation better against resistance, being able to keep relaxed and aligned without tensing up. How do you know that you can keep being relaxed if you don’t test it against resistance? Yes, when you have done some throwing around with people, then your solo practice will be quite different compared to if you didn’t have that experience of throwing someone. This is also why Tai Chi will be wrong if the correct body connection is not learned through applications and push hands. The balance and structure will be completely different compared to if you only do solo practice. I think heavy punching bag is the best way to test the one’s frame. However over emphasis on the bag will lose all rounded sensitivity. Because bag is bit of unidirectional. Overlord wrote: I think heavy punching bag is the best way to test the one’s frame. - whole body, you have the unified frame. - arm, you don't have the unified frame. The roundhouse kick can give you the same feed back as well. I've had a couple of semi-pro to pro level fighters tell me over the years that as an amateur you should never shadow box. The only thing you should work on is power generation and timing. Their basic point was that until you could throw a proper punch, which as boxers they said took 2-3 years to get, and land it that nothing else mattered. With a little elaboration, they explained that shadow boxing threw timing off and interfered with power generation in those that didn't have it yet. I was never that good. But I took their point about power to heart and always had a decent jab and overhand left. Frankly those are the only two punches I had that were any good. But if I got to someone and could punch into that upper right corner of their head, they were in trouble. Without proper timing it was hit or miss on my end. If I had ever developed proper footwork, it probably would have worked a lot better. cloudz wrote: I can understand if your lifelong practice has been one sided for so many years, you probably have things to make up for, I imagine it's more a mental thing in your case. In one 3 months summer, I trained 5 days a week, 6 hours daily that I had paired up with my long fist brother. We just repeated the long fist form non-stop. When I did the form, my partner watched. When my partner did the form, I watched. Today, I look back, those kind of training was not balanced. Last edited by johnwang on Thu Nov 22, 2018 6:25 pm, edited 2 times in total. Last edited by windwalker on Fri Nov 23, 2018 6:19 am, edited 2 times in total. Peacedog wrote: Without proper timing it was hit or miss on my end. If I had ever developed proper footwork, it probably would have worked a lot better. It seems a bit wierd to me - and probably to many coaches that you would only focus on power/ heavy bag for years did you say? Power isn't much use if you can't be in the right place to land it for example. Padwork addresses the timing and accuracy predominantly. Footwork can be (probably best way) addressed by shadowboxing. That's where you can really work on things both seperately and putting them together:your footwork, combos (techniques) and defences. Footwork is what will get you to where you need to be. . They really should be more than able to work together concurrently and synergystically. I have never actually heard a really valid reason why not. And I'm also sure thousands of boxers would testify that it can work fine.. I get the point of going at a pace that doesn't get ahead of one's ability and capability of putting things together. But there's also little point in stringing things out unecessarily. As always there's a balance to be struck. The other important drills are sparring, which could take various progressive forms up to full. When you work up to that using the other 3 discussed, the idea of shadow boxing throwing off timing is kind of a strange one. Last edited by cloudz on Fri Nov 23, 2018 5:34 am, edited 3 times in total. The individuals in question said shadow boxing threw off timing, particularly in amateurs, because in shadow boxing you are always pulling your punches. And that interfered with proper power generation in those that didn't have it yet. Which was their whole point. Basically you had to land the power at full power with proper timing to get everything to work right. People forget that part of throwing a proper full power punch is the object/body on the other end absorbing a lot of the force. Anything that caused you to pull back from any part of that threw off the rest. Not using full power caused problems, because you can't really hit the air. Messing with a boxers spacing as the distances you moved into with shadow boxing didn't really match a body. All of that contributed to reinforce bad behaviors/mechanics in amateurs. And yes, sparring was the other thing you needed to do a lot of as well.